His trademark cartwheel celebration may lack the zest of yesteryear yet Robbie Keane plans to be still pocketing goals at 38 - whether that's in America or elsewhere. The 34-year-old is back in Dublin just a couple of weeks on from capturing the Major League Soccer's Most Valuable Player (MVP) accolade and firing LA Galaxy to their third championship in four seasons. 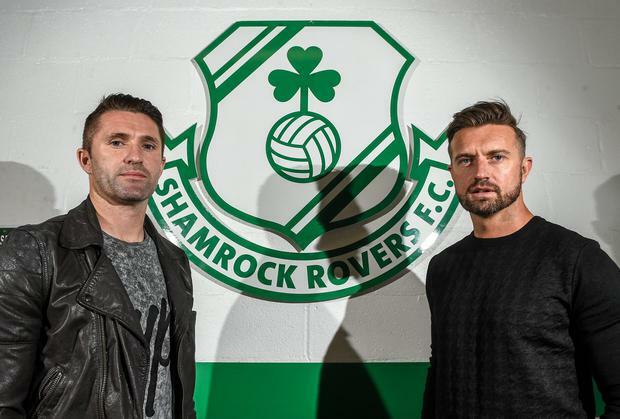 Keane returned to familiar terrain yesterday to officially announce details of a friendly against Shamrock Rovers in his native Tallaght on February 21, but the Ireland captain won't be including another loan stint at an English Premier League next month as part of his preparations. Having resolved his niggling Achilles problems with surgery a year ago, Keane is feeling in suitably tip-top condition to be contemplating more appearances in the league that he first made his name in. Although Aston Villa provided him with a winter outlet at this stage two years ago, there's the bigger picture of extending his career to factor into this equation this time around. "I've been asked to go on loan by clubs, mostly in the Premier League, but it's not going to happen," admitted Keane yesterday, sitting in the Glenmalure Suite. "Medically, I've been advised to take a break. Two days I after I came home from America last year, I had the operation on both of my Achilles and was back doing intensive training two days later. That's 22 months without a break, so I need one now. "After a few weeks off, I start to get the itch and I've got that now. I was playing five-a-side with my mates 10 days after the MLS Cup final. I feel the best I've felt for years. "Our break [in the MLS] is that little bit longer so I feel the temptation is there only because I love playing the game. "Although that's there, I just can't see it [the loan] happening, to be honest." Under contract with Galaxy for another year at least, doubts still surfaced over Keane's future following their title win when he supplied an open answer to the post-match question. He said: "I see myself playing for three or four more years, 100 per cent, so I need to be honest with everyone that my future is beyond next year. "And for me to concentrate on playing for Ireland, and focus on playing in the Euros, I have to look beyond then. I never said I was going to leave the Galaxy but I need to see what's best for myself in the long term. "That's the reason I was being honest, too much perhaps, but I don't want to see myself going the Euros year [in 2016] wondering what's going to happen." Whether Keane gets to participate at his second successive Euros hinges on Ireland reversing their abysmal home record in the new year. Ireland's talisman was controversially dropped for the defeat in Scotland and fully "expects" to play when Group D pacesetters Poland come to Dublin on March 29. In the battle for the second qualifying berth from the pool, the Dubliner remains confident about overcoming the Poles and fellow challengers Scotland, who visit in June. "I would fancy us at home against anybody, so I certainly believe we can take both of those teams [Poland and Scotland]," he asserted. "Take Germany out of the equation - on their day they can beat anybody - and there's not much between the other three teams. You wouldn't say anyone is a lot better than anyone else. Playing at home in front of a home crowd, we can be as good as anyone. "We had a great result in Germany, and you'd want to go on and build on that. "I still think we have a great chance of qualifying and we all have to believe that as well."